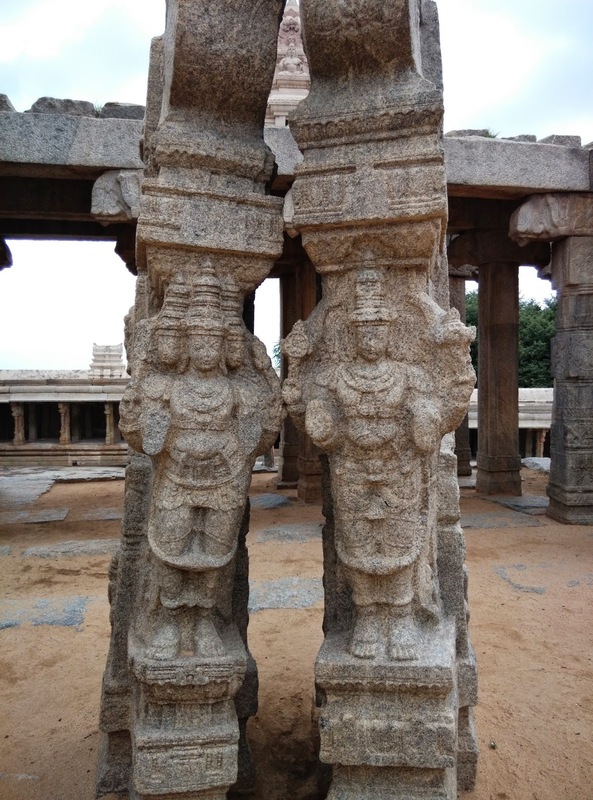 Lepakshi is small town in Andhra Pradesh. 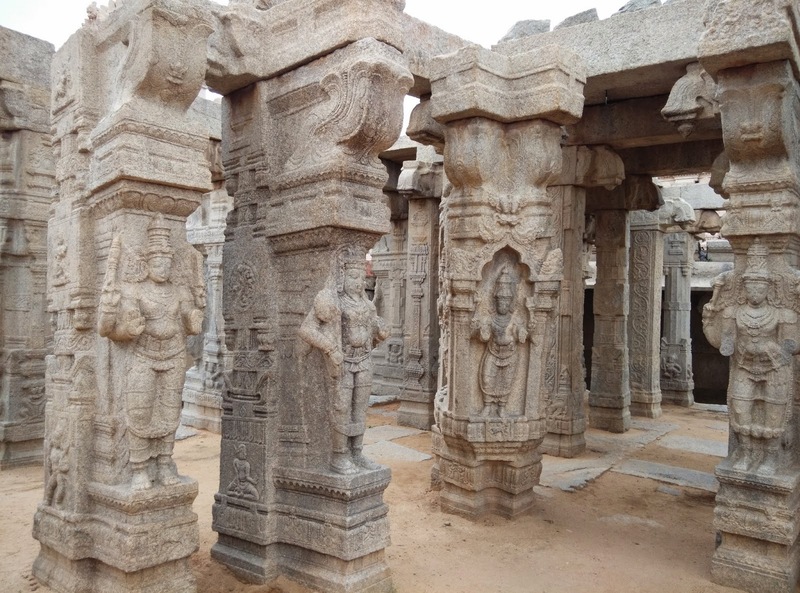 I heard about the hanging pillars in Lepakshi but it was not quite on my list. Diwali festival was near and I took one week off to celebrate Diwali at my hometown. Plan was to take train on Friday night, unfortunately didn’t get confirmed ticket and I had to stay two more days in Bangalore before I took flight on Monday to reach my hometown. After lazy Saturday at home, I thought it’s better to go out and explore nearby places.Nandi hill was on my mind. As usual I was browsing internet to find out the route and nearby places. 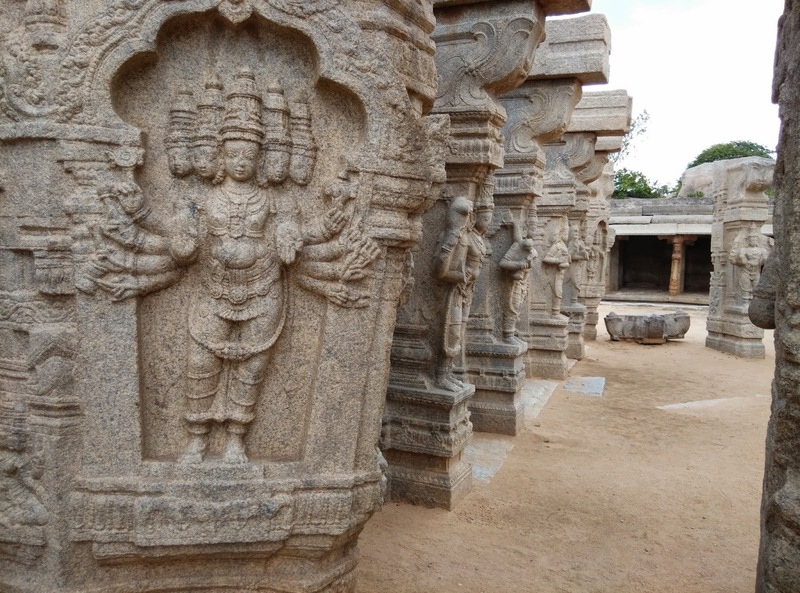 I came across Lepakshi. Umesh was with me and we both went off for a short bike trip. 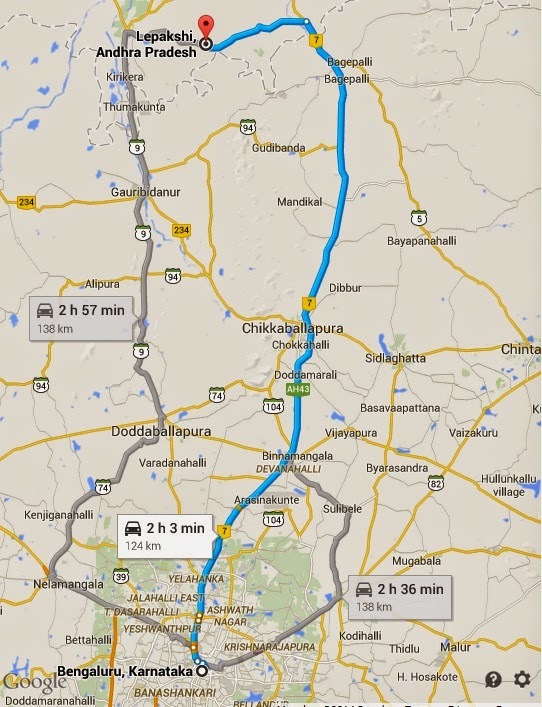 Lepakshi is 130 km from Bangalore, mostly on NH7. It was really pleasant drive, as weather was cool, bit cloudy but luckily for us, the rain stayed away and national highway was great for biking. 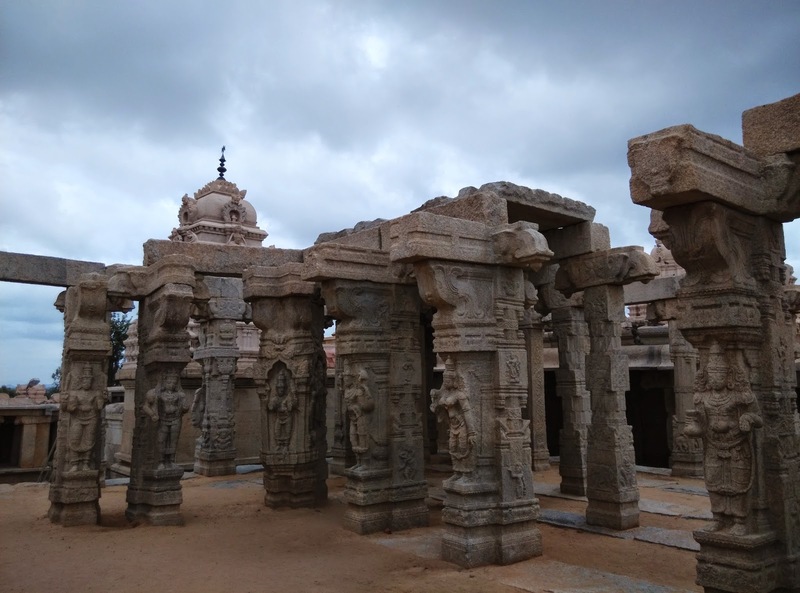 Vijayanagar architectural style temple, structure of big Nandi bull, hanging pillar, the seven headed snake, Ganapathi sculpture, unfinished Kalyan Mantapa and interesting stories behind this place. Let me start with bit of history, religious and historical significance of this place. 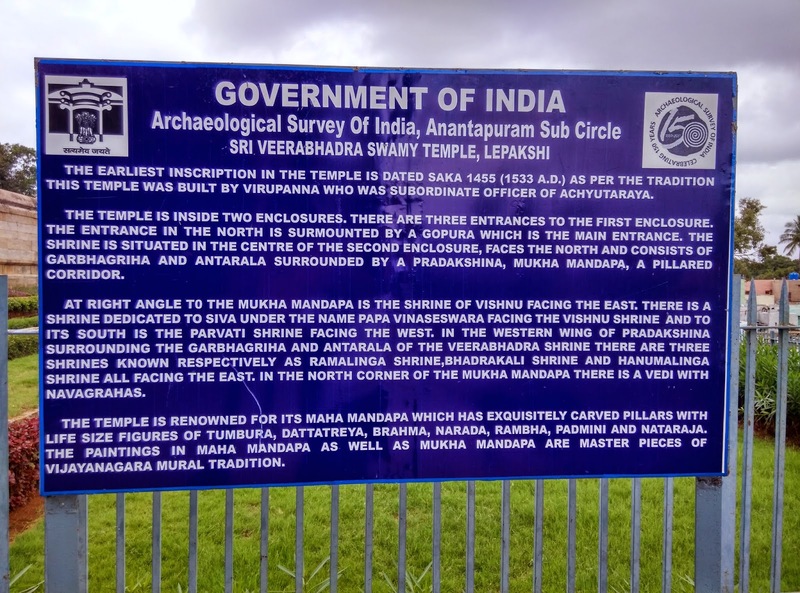 First the name of the town “Lepakshi”. Most of you are aware of Ramayana and the big bird Jatayu who battled with Ravana to save Sita. During the battle Ravana injured Jatayu very badly and took away Sita in his flying chariot. Lord Rama found Jatayu in this place, healed Jatayu and said Le Pakshi (Rise Bird), Jayatu rose again. 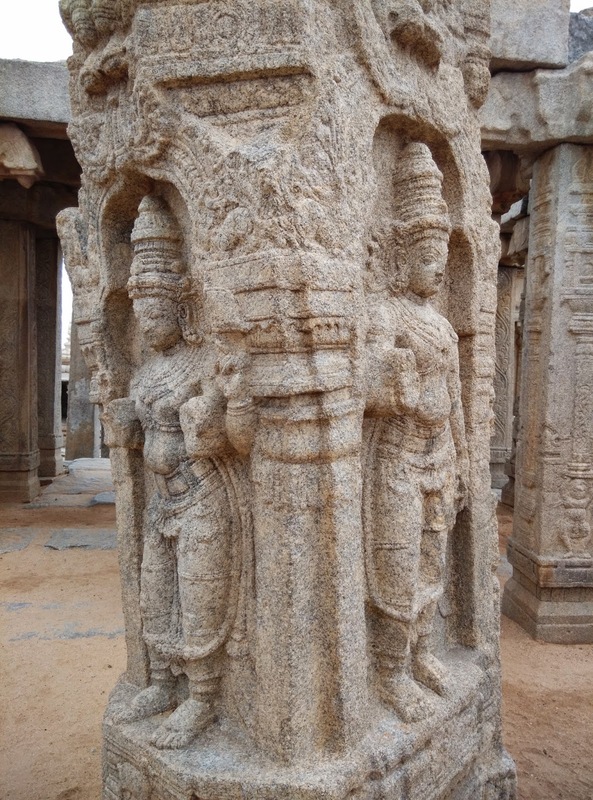 Now the sad story.Virupanna was the treasurer of Vijayanagar kingdom, Some ministers were against him and they started making false accusation of him, they accused him for drawing funds without the king’s permission and complained King. King believed them, decided to punish Virupanna and ordered that his eyes should be plucked off. Hearing this from other Virupanna was shattered and blinded himself by plucking his eyes out and throwing them on the walls. 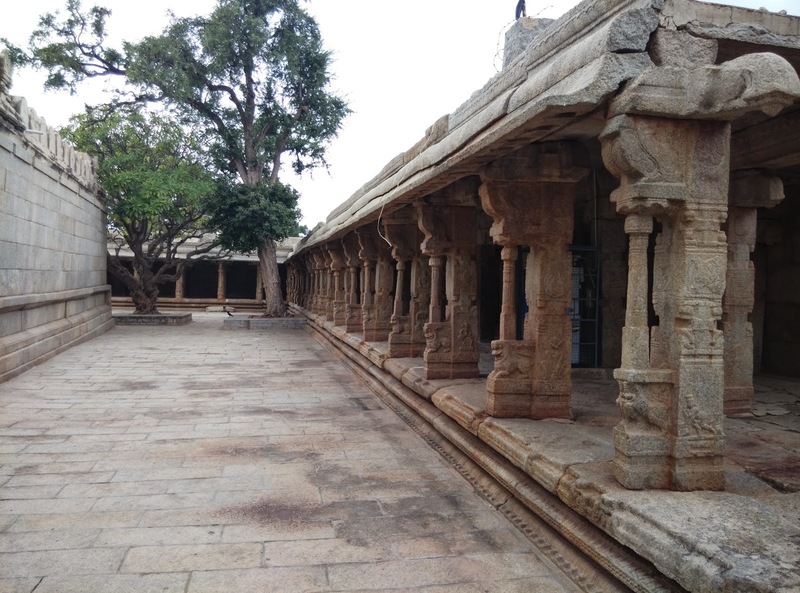 The blood stains are still there.The flase accusation was related to making of Kalyana Mandapa.and then after this incident it was left incomplete. Temple complex is big, neat and very well maintained. There is no entry fee and once you enter the temple you will see Long corridors with pillars. 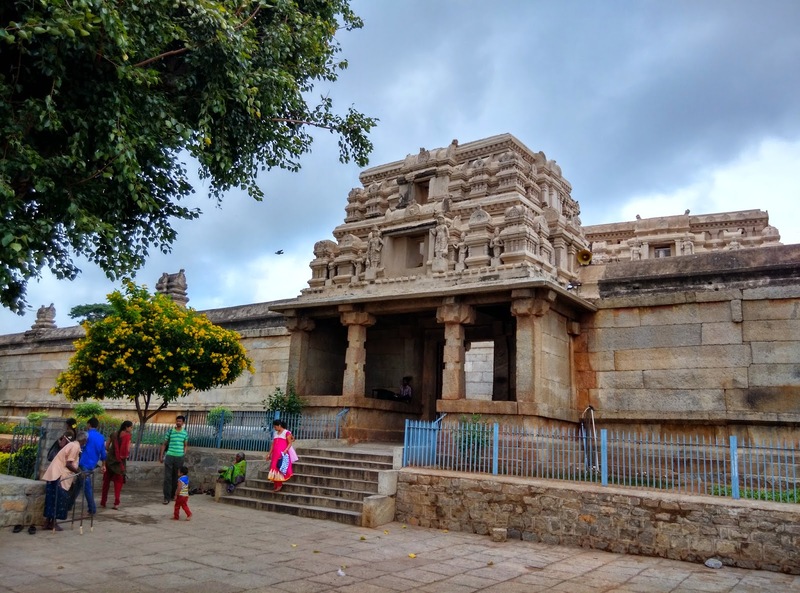 First we decided to see the main temple, Veerabhadra swamy and goddess Durga are worshiped at the same place, we offered puja and then started exploring the entire temple complex. At the first glance, you will see pillars everywhere. Long corridors with pillars runs around the temple but all the pillars are beautifully carved and prove the artistic brilliance from Ancient India. 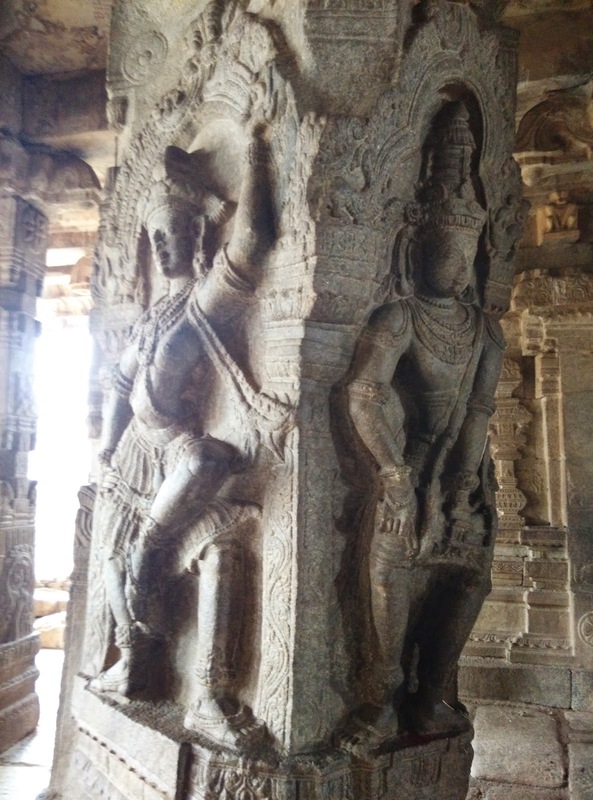 Seven hooded snake protecting big shiva linga is another attraction. Its big structure and looks like it was carved out of single big stone.Lord Ganesha was also carved out from the same stone. 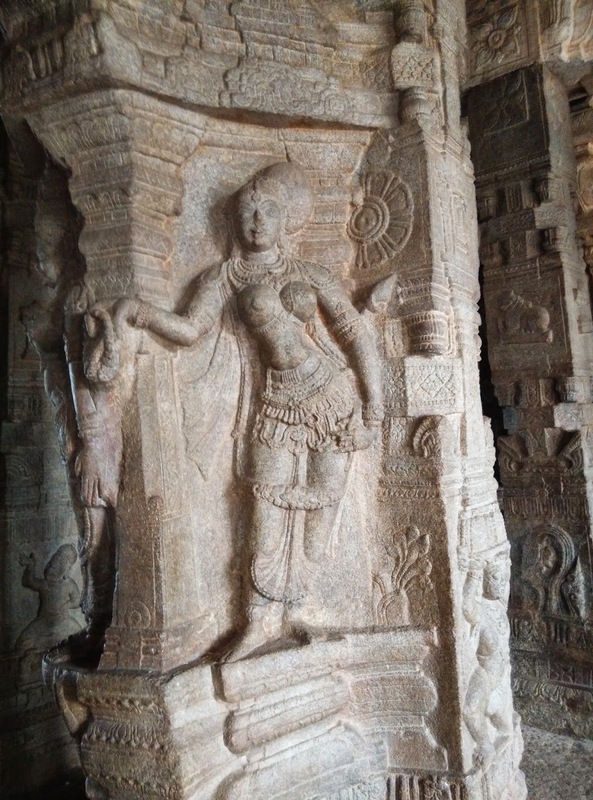 The back of Shiv Linga is the unfinished Kalyana Mandapa. All the pillars created with beautiful carvings. Most of the pillars represent many Gods and figures. Looking in to each and every pillars will remind you the kind of work done by ancient India. 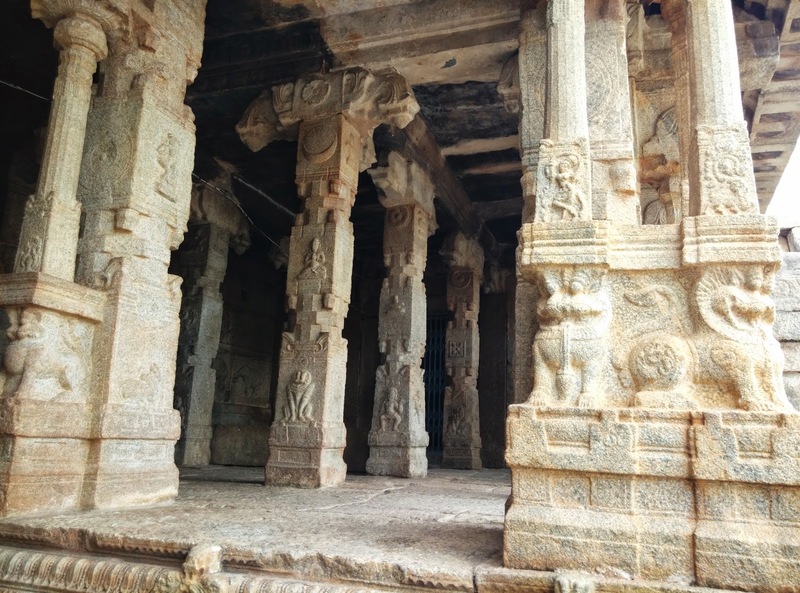 With very limited tools and such a hard stone, how did they carve out beautiful structures,every pillar tells a story, the way the stones are carved out is just astonishing. Dancing hall, with carved pillars.Another thing you will notice is the roof, there are so many beautiful paintings done by natural color mixtures. These painting depict several stories from Ramayana. Temple is more than 500 years old and it was great to see the way temple is maintained. ASI is doing very good job over there. 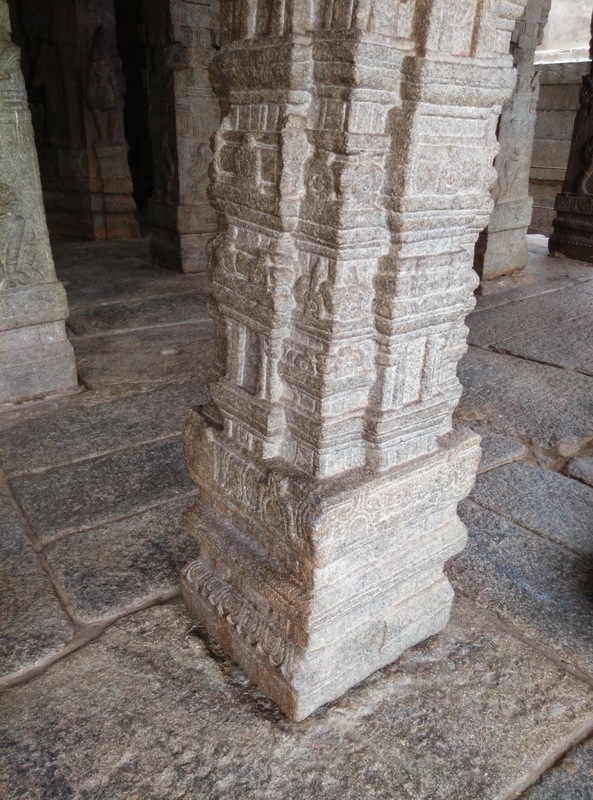 And there is one pillar, popularly known as hanging pillar. Though its not completely hanging, You could see the gap between the pillar and the floor but small part is attached with floor. 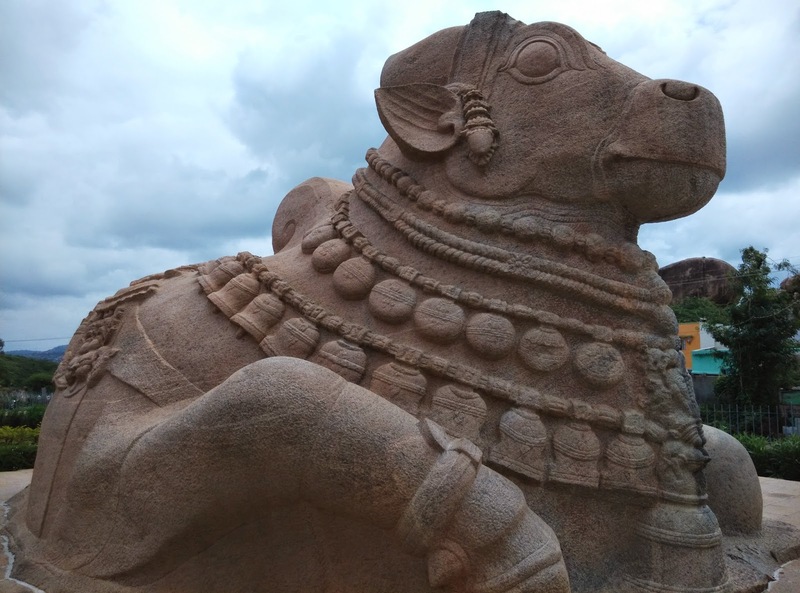 200 meters from temple, there is one big granite bull on the main road, claimed to be India’s biggest monolithic Nandi. Overall it was good one day trip. 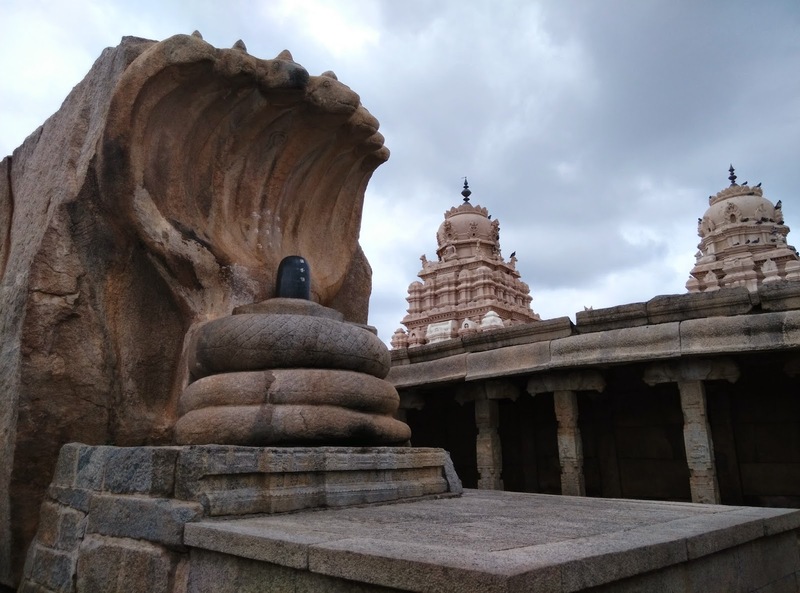 I know Lepakshi is not very known place, not much promoted as tourist destination but its really good place if you are interested in history, ancient India architects and brilliance. Perfect weekend gateway from Bangalore. 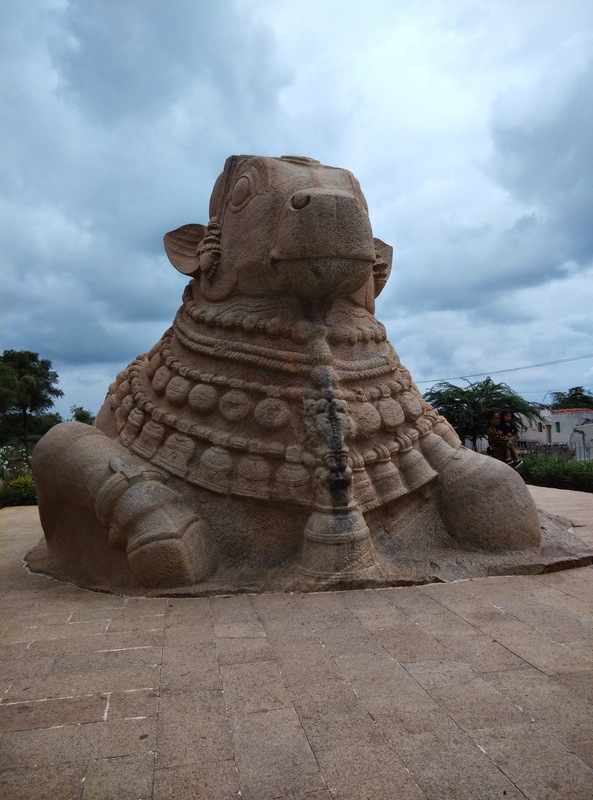 There are two route to reach Lepakshi but I would recommend Bangalore -> Devanahalli -> Chikkaballapura -> Bagepalli -> Lepakshi as its mostly on national highway 7 as you can easily reach Lepakshi within 2 hours.